An Important and Palatial French Louis XV Style 19th Century Gilt-Bronze and White Marble Cherub Mantel Clock, attributed to Alfred-Emmanuel-Louis Beurdeley, the casting and gilding by Graux-Marly, Paris, the movement by P. Marti et Cie. 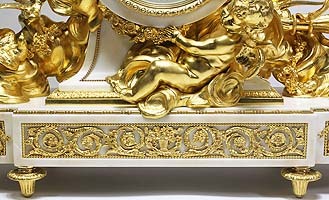 The large and impressive marble and two-tone finely chased gilt-bronze (Ormolu) and white marble body, with its original superb quality mercury satin-gilt and burnished gilt (ciselé et doré au mat), surmounted by two reclining cherubs amongst clouds, one holding a triumphant floral wreath, the other a floral bouquet strand, flanked to each side by floral swags and attributes of Love, with kissing doves, on a shaped base with a further cloud-borne cherub, above a scrolling foliate frieze and garlands of flowers, with a bow, a quiver, trumpets and arrows protruding through within the clouds, raised on toupie feet. The beautifully decorated circular white enamel dial with gold fleur-de-lis' jewels, with Roman and Arabic numerals, signed "Graux Marly, Paris - Rue du Parc-Royal, 8". The bell striking movement stamped: "S. Marti et Cie. Médaille de Bronze". Circa: Paris, 1870's. The Jules Graux's Foundry was based at 8 rue du Parc-Royal from 1860, they exhibited at the last national exhibition in Paris in 1849 and again Paris in 1855. At the London exhibition of 1862 their entry was described as, "bronzes d'ameublement, cheminée et garniture de cheminée, lustres, vases, statues, groupes, objets de service de table, gueridon de malachite." They are recorded as exporting 35% of their production and as having made bronzes for the Hotel de la Commission. They also contributed to the Paris exhibition of 1867. By 1870 his sons M Graux-Marly took over the business from their father and, from then on, their works were stamped GRAUX-MARLY or GRAUX-MARLY FRÈRES. The foundry in renown for producing high-quality bronze castings, chasing and gilding, including clocks, candelabra, statuettes and other fine decorative works of art. Jules Graux - Graux-Marly Fondeurs also cast bronzes for many of the most renowned sculptors of the day, including but not limited to Jean-Baptiste Carpeaux (French, 1827-1875), James Pradier - born Jean-Jacques Pradier (Swiss/French, 1790-1852), Emmanuel Frémiet (French, 1824-1910), Albert-Ernest Carrier-Belleuse (French, 1824-1887), Alfred Emmanuel Louis Beurdeley (French, 1847-1919) as well as reproducing important and popular antique, from the Renaissance and later models. Related Literature: P. Kjellberg, Les Bronzes du XIX Siecle, Les Editions de l'Amateur, Paris, page 660. Beurdeley, Alfred Emmanuel Louis (French, 1847-1919): Work at first with his father in Paris and eventually succeeded him. He kept the shop at rue Louis-Le-Grand and had worked at Nos. 20 ˆ 24 rue Dautancourt. The business continued in its traditional style with very few variations, until it was closed in 1895 and the remaining contents of the company were sold at the Galerie Geroges Petit. Beurdeley exhibited at the 1878 Exhibition. 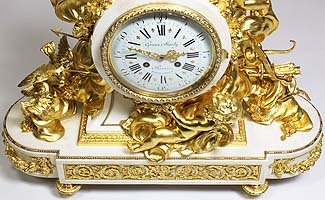 LITERATURE AND REFERENCES: Tardy, The Most Beautiful French Clocks, Paris, 1994, pp. 162-163 for illustrations of similar eighteenth century dial know as à la dauphine by Cotteau and Dubuisson. Ottomeyer/Proschel, Vergoldete Bronzen I, Munich, 1986. 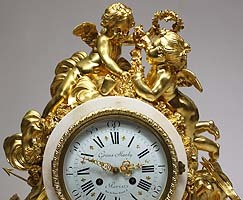 An Important and Palatial French Louis XV Style 19th Century Gilt-Bronze and White Marble Cherub Mantel Clock, attributed to Alfred-Emmanuel-Louis Beurdeley, the casting and gilding by Graux-Marly, Paris, the movement by P. Marti et Cie. 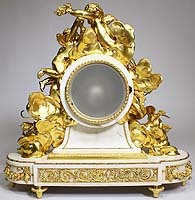 The large and impressive marble and two-tone finely chased gilt-bronze (Ormolu) and white marble body, with its original superb quality mercury satin-gilt and burnished gilt (ciselé et doré au mat), surmounted by two reclining cherubs amongst clouds, one holding a triumphant floral wreath, the other a floral bouquet strand, flanked to each side by floral swags and attributes of Love, with kissing doves, on a shaped base with a further cloud-borne cherub, above a scrolling foliate frieze and garlands of flowers, with a bow, a quiver, trumpets and arrows protruding through within the clouds, raised on toupie feet. 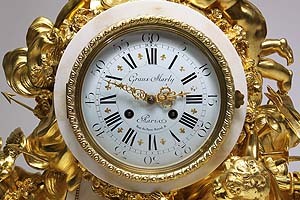 The beautifully decorated circular white enamel dial with gold fleur-de-lis' jewels, with Roman and Arabic numerals, signed "Graux Marly, Paris - Rue du Parc-Royal, 8". 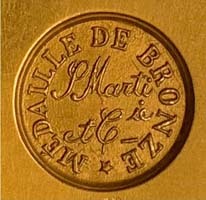 The bell striking movement stamped: "S. Marti et Cie. Médaille de Bronze". Circa: Paris, 1870's. The Jules Graux's Foundry was based at 8 rue du Parc-Royal from 1860, they exhibited at the last national exhibition in Paris in 1849 and again Paris in 1855. At the London exhibition of 1862 their entry was described as, "bronzes d'ameublement, cheminée et garniture de cheminée, lustres, vases, statues, groupes, objets de service de table, gueridon de malachite." They are recorded as exporting 35% of their production and as having made bronzes for the Hotel de la Commission. They also contributed to the Paris exhibition of 1867. By 1870 his sons M Graux-Marly took over the business from their father and, from then on, their works were stamped GRAUX-MARLY or GRAUX-MARLY FRÈRES. The foundry in renown for producing high-quality bronze castings, chasing and gilding, including clocks, candelabra, statuettes and other fine decorative works of art. Jules Graux - Graux-Marly Fondeurs also cast bronzes for many of the most renowned sculptors of the day, including but not limited to Jean-Baptiste Carpeaux (French, 1827-1875), James Pradier - born Jean-Jacques Pradier (Swiss/French, 1790-1852), Emmanuel Frémiet (French, 1824-1910), Albert-Ernest Carrier-Belleuse (French, 1824-1887), Alfred Emmanuel Louis Beurdeley (French, 1847-1919) as well as reproducing important and popular antique, from the Renaissance and later models. Related Literature: P. Kjellberg, Les Bronzes du XIX Siecle, Les Editions de l'Amateur, Paris, page 660. Beurdeley, Alfred Emmanuel Louis (French, 1847-1919): Work at first with his father in Paris and eventually succeeded him. He kept the shop at rue Louis-Le-Grand and had worked at Nos. 20 ˆ 24 rue Dautancourt. The business continued in its traditional style with very few variations, until it was closed in 1895 and the remaining contents of the company were sold at the Galerie Geroges Petit. Beurdeley exhibited at the 1878 Exhibition. 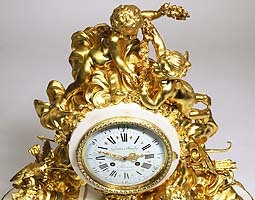 Tardy, The Most Beautiful French Clocks, Paris, 1994, pp. 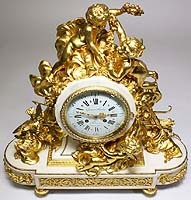 162-163 for illustrations of similar eighteenth century dial know as à la dauphine by Cotteau and Dubuisson. Ottomeyer/Proschel, Vergoldete Bronzen I, Munich, 1986. The model of this clock can be found in the Beurdeley sale in 1895, 6-9 May: Catalogue of Furniture and Works of Art made in the workshop and under the direction of M.A. 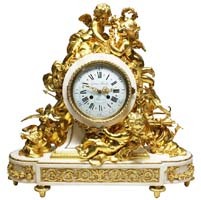 Beurdeley, lot number 46, described as Pendule de style Louis XV, en marbre blanc, avec groupes d'amours dans le goût de Boucher, tenant des guirlandes de fleurs en bronze ciselé et doré au mat. 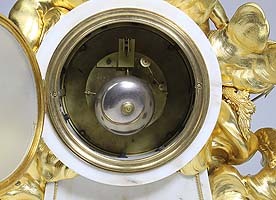 Le socle en marbre blanc est enrichi de rinceaux et de guirlandes en bronze doré Haut. 68 cent. Larg. 68 cent. It was acquired by M. Martin Fuld for 1600 francs or. This model can also be found in the Catalogue des modèles pour bronzes d'art, meubles de style et de grande décoration provenant de la Maison A.Beurdeley, from 19-22 October, 1897 under the lot number 50, described as: Pendule Louis XVI, enfants aux nuages. It relates to a model made circa 1780, illustrated in H. Ottomeyer & P. Pröschel, Vergoldete Bronzen, Munich, 1986, Vol. I, p. 251, no. 4.6.23. 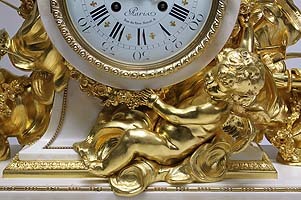 Note: The Beurdeley attribution is not only based on the high quality and model of this mantel clock, which he is known to have produced, but also the fact that both Jules Graux, Graux-Marly as well as S. Marti et Cie., all worked with and provided works for the Beurdeley workshop. The old photograph below features this model of mantel clock in the Beurdeley's workshop archives.